‘Supergirl’ Recreates Another Classic DC Cover, Plus … ‘Superman’ Spinoff? Supergirl had its fun with iconic covers of DC past when The Flash came to town, and it looks like The CW will follow suit with a major Crisis for Tyler Hoechlin’s second Superman episode. Plus … could the Man of Steel wind up with his own CW series? 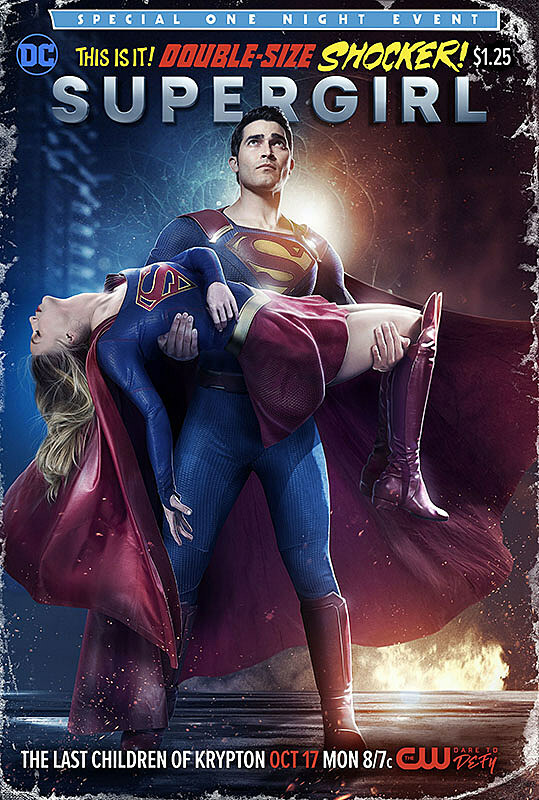 Ahead of tonight’s “The Last Children of Krypton,” The CW released key art similar to an image seen in the recent trailer, evoking the classic 1985 Crisis on Infinite Earths #7, in which the Girl of Steel was killed off by the Anti-Monitor. Naturally, Supergirl isn’t about to bump Melissa Benoist of her own show, but the imagery is effective nonetheless. We’re so happy with what we get to do. I don’t mean for that to sounds as bad as it does, but we asked if we could have Superman in the first episode, and DC and Warner Bros. said ‘you could have him for the first two episodes’ and we were like ‘great!’ I’m not going to sit here and say that there’s never going to be a world in which there’s a Superman TV show and that Tyler’s going to star in it — I don’t know what the future holds, but right now that’s not our focus. You can catch Superman’s second Supergirl appearance tonight, clips for which you can find below. Source: ‘Supergirl’ Recreates Another Classic DC Cover, Plus … ‘Superman’ Spinoff?